How can I forget! Before attending St Martin’s in August I visited Guy’s and St Thomas’ Hospital in London. 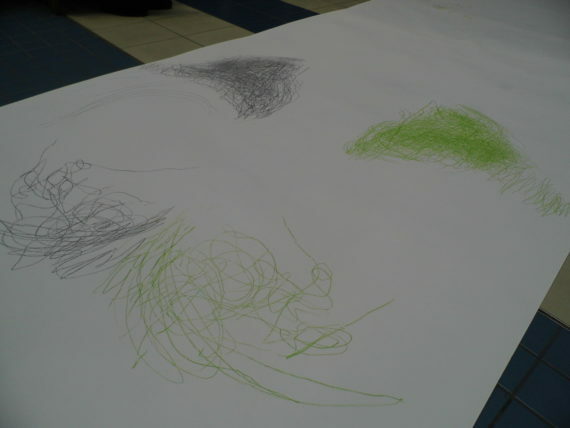 I took part in a wonderful workshop focusing on Art, Health and Wellbeing. When I visited, it was tightly packed during the life event – not long at all after it happened, my emotions were still raw, so this was so wonderfully timely, this oasis of calm. So writing about St Martin’s will be delayed as it is very important that I talk about this first, seeing as it happened first. It really was a magical experience. One reason, possibly, that it slipped my mind was that it was quite ethereal and other-worldly, something hovering and floating in the hinterland, just short of my grasp. Another reason, perhaps, is that it was squeezed, amidst a time of grieving and the backwards and forwards across and betwixt counties to sort through rooms of family history and cupboards full of love in the form of keepsakes, school books and photo albums. This couple of hours of otherworldliness was led by artist and doctor Angela Hodgson-Teall. I wouldn’t call it a workshop, more an experience. 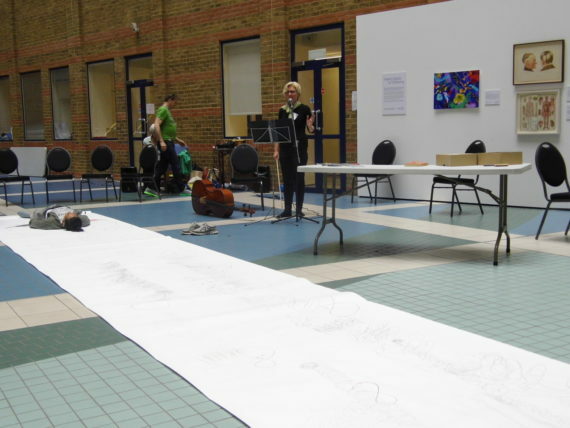 It was called ‘Preferring Laughter to Tears’ and was part of the London Creativity and Wellbeing Week (run by the London Arts in Health Forum) that was taking place between 13th and the 19th of June. As well as being included in this wonderful event it was also part of the Making Space for Wellbeing Programme in collaboration with Guy’s and St Thomas’ Charity. Free events and concerts are put on under the expansive glass atrium for patients, staff and public alike. A wonderful concept that allows all to come together for however long or short a time as they wish – I saw patients and relatives come for a restorative break, visitors come in from the outside world and staff stopping off to eat their sandwiches and catch up with colleagues. I had raced in, in a little bit of a fluster. Having arrived at London Bridge Station (via Northampton and Euston) I was amidst the redevelopment works that were (to a visitor) very disorienting. Large areas boarded up with high white hoardings, blocking off the construction work from view, but also having the unnerving effect of disengaging your brain and removing any directional sense. I had meticulously planned my day, there was a lot to include and not knowing which event would inspire me the most, I needed to make sure that I visited them all. Preferring Laughter – St Guys Hospital; Paintings in Hospitals – The Mernier Gallery; Drawn – University College Hospital ….. and then of I got time (not part of the event) the good old, never fails Wellcome Collection. 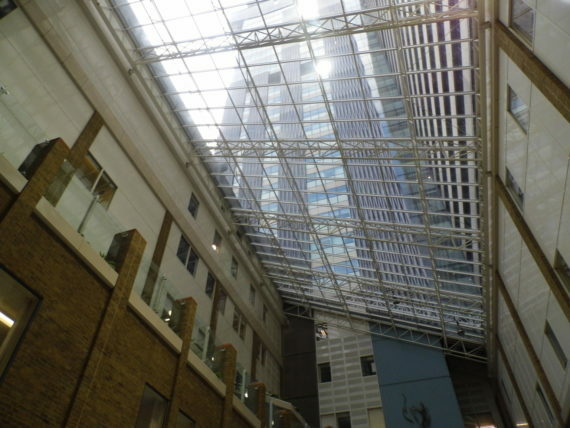 So, I navigated successfully my way to the hospital, enquired at the reception desk as to the precise location, meandered my way through corridors, entered doorways, followed signs until I arrived – into a vast space, an atrium, dominated by a spectacular glass roof. I was a bit late and anxious that I had missed the start. This was the one event that I wanted to catch the whole of – experience from start to finish. I was greeted by a lovely volunteer at the hospital. She welcomed me in (even though this space was vast, the atmosphere was such that I felt that I was entering into a vessel or cocoon). It was suggested that I removed my shoes and coat and then I was introduced to the artist – the gentle and calming Angela. Angela explained the process and I tried my best to acknowledge what she was saying as my head was still swimming from trains, tubes and traffic. 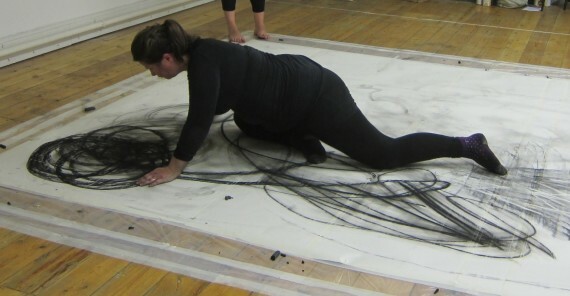 The objective was to lay on ones back and gradually move up a long sheet of paper. In each hand were placed two drawing tools. I could close my eyes or keep them open. I could listen to the sounds or not – as I wished. I could be inspired by the sounds – or not as I wished. I was not to draw objects, or look at what I was drawing, but feel the drawing, draw in and out away from, around and too my body, but staying relaxed however, moving the arms comfortably. I think that Angela said that this was to be an empathetic experience, that she is focusing on art and empathy as a conduit to heal. I explained about my very recent experiences of grief and the effect that that has on your life when someone close to you dies. She said that this was a brilliant example of why she conceived this project. The stresses, the anger, the melancholy that we experience throughout life can build up and ultimately effects your body and mental health. The health of our spleens are an indicator of how healthy our bodies are. The spleen filters our blood and is a key part of our bodies immune system. It can enlarge, deflate or have decreased function. It just so happens, that as well as being an artist, Angela has trained in medicine, so she knows a thing or two about spleens – and she is in the final stages of her PhD study ‘Drawing on the Nature of Empathy’ – so she also knows a lot about drawing and empathy. I was in very safe hands. I removed my boots, tucked them under a chair and lay down onto the paper, making sure my bottom was placed squarely on the paper. Angela knelt beside me and quietly spoke to me. Would it be ok if she massaged my spleen? This would help me to centre and relax. She did say that she could tell if someone had problems with their spleens when she did this, but that she wouldn’t be indicating this. I was to say however if it was at all uncomfortable. Although there was a slight sensation of tenseness, all in all it was extremely soothing – remarkably so, as having ones spleen massaged isn’t the most everyday of occurrences. Angela subtly indicated that she would leave me be and gently peeled away. I was vaguely aware of her moving away elsewhere – I had closed my eyes at some point during the spleen massage. My brain was gradually acclimatising to this experience – and beginning the process of letting go of the morning stresses. I was slowly moving inside of myself, while also remaining conscious of my surroundings – that I was in an expanse of space and surrounded by people. My hands started to move, nervously at first. Lightly marking the paper, small scale marks, close to my body. Tentative. Feeling for my centre. I lay there for a while, allowing my hands to move freely, as much as possible without any particular instruction. I started to shunt up the paper, a little bit at first. I was aware that I had a long way to go and I couldn’t hog the start line as others may be waiting to start. At some point, someone started reading poems by Keats and then extracts from Midsummer Nights Dream, I think it was Angela. I couldn’t work out where the voices were coming from, they were quiet, almost whispered. Then a chime or some Eastern Percussion instrument was played, nearer to me – whilst Angela was speaking – so there must be someone else there, performing to me, through me, empathising with me through sound. 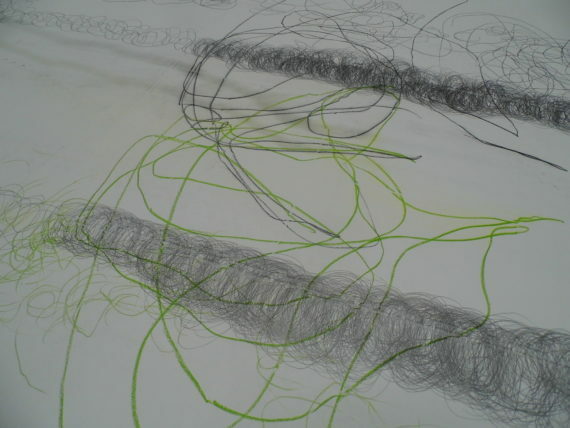 As I traversed the paper, creeping upwards, my movements became much more confident, the marks flowing from my body, concentric lines and waves. I decided opened my eyes for some reason. I found that I was immediately under the glass of the atrium. And there was the shard – towering above, piercing the sky above it, while dwarfing my body as it lay exposed below it on the hospital floor. I lay there for while, watching the sky and life as it within it. Pigeons performing their own version of Parkour, fluttering from one roof top to another. Birds flying far far above – higher than the adjacent tower block, hardly visible. And then the planes, tracking their flight lines through this small pocket of air space. This was all making feel very vulnerable, so I promptly shut my eyes to revert back to an empathic state. I re centered. A cello began playing some soft harmonic sounds, its vibrations caressing my ear drums, some times imperceptible. A piano joined in, dulcet murmurs conversing with the cello. I wanted to respond to the music. My marks began to echo the sounds, long stretches that mimicked the length of the cello bow as it ran across the string, then playful movements, brief and gentle interactions with the paper that responded to the internal workings of the piano as they momentarily lighted upon a string. Angela started to read another poem. It was hers I think. About a bird. About her studio. About her thoughts. I allowed mine to melt away once again and I imperceptibly moved along the paper, existing somewhere between the out and the in. 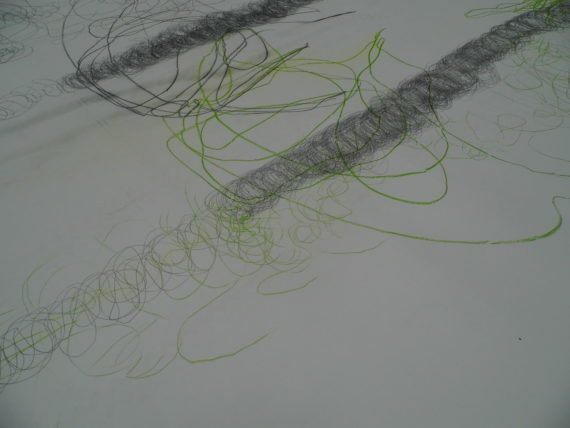 I stood up and walked along and around the drawings, sensitive to the others that were now taking part. Patients and volunteers spoke to me, but I struggled with their wish that I was in the present. I wanted to be back there – within. I picked up my camera, to record my spleen drawings as they interlaced with others, but also to feel that I was once again inside a dark space, where no one else could come in. My marks are those that are meandering and wayward – reaching out to the extremities. The others, the tight concentric marks, patient in their rendering, focused and zen like are by the person that followed me. I watched them as they seemed almost to remain perfectly still, hardly moving at all. What was it like inside his mind compared to mine? Was he being intuitive or was he controlling his marks? Was he thinking in artistic terms or were they purely expressing his empathy? I ask this as I remember that I had a discussion with myself over deliberate mark making – why don’t I try this type of mark – I need to make it larger/smaller. It is very hard to switch that internal critical commentator off and draw completely without direction. Achieving complete intuitiveness is very hard to do, but it is a beautiful and ethereal experience to try. I left feeling a lot more peaceful than when I had arrived. I left knowing that I had been a part of something that had touched me in many ways. Personally and professionally. The power of drawing as a conduit, a mechanism to express, exhort, to centre, to remember, to forget, to heal. I shall leave this here, at this point. The process of remembering has had a similar effect on me as the process of drawing did at that time. I want to experience that, even if for a short time, however vicariously.